On Saturday 27th October 2018, all roads leads to Central School Ekwulobia, venue, of the 14th annual Academic awards for Excellent and brilliant students, being organized by Chief Sir Engr Barth Nwibe. 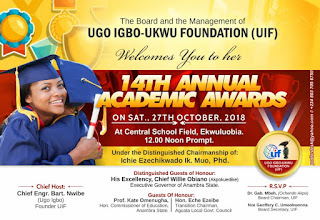 The event is organized annually by Barth Nwibe and Ugo Igbo-Ukwu foundation, as part of his philanthropic gestures and a way of encouraging younger ones to take their education very serious, because education is very important and the gateway to a successful life. Chief Sir Engr Barth Nwibe is a well known grassroot politician and mobilizer. 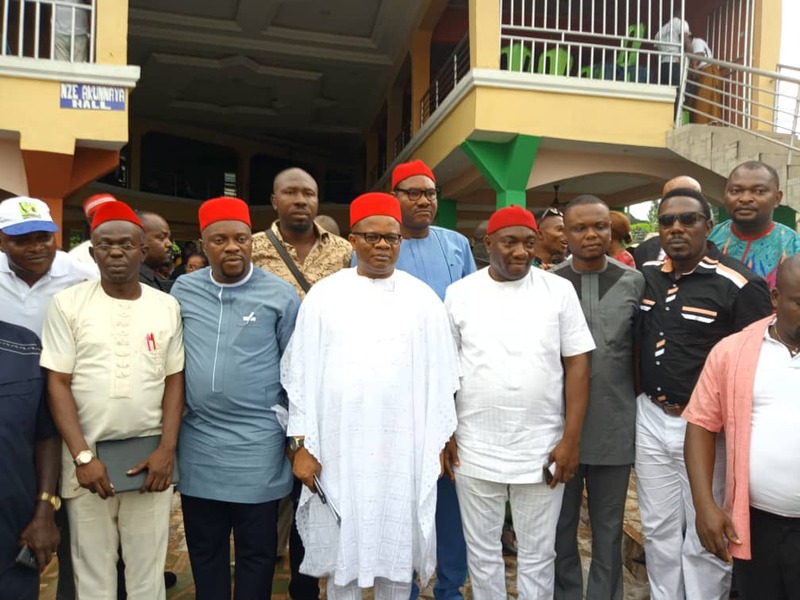 He is one of the highest financier of APC in Anambra State and has supported several hundred political aspirants and many other Candidates of our party in various forms. He is generally referred to as Ugo Igbo. He was ACN candidate for Federal House of Representatives for Aguata federal constituency and a Former Governorship Aspirant of APC in Anambra State. Recently, he was appointed, the Chairman of board of University of Jos Teaching Hospital. Born on the 9th of July, 1961 to Mr. Joseph Nwibe, trader and Mrs. Elizabeth Ifeyinwa Nwibe of Etiti Village, Igbo-Ukwu, Chief Engr Nwibe began his primary education at St. Martin’s Ihite Igbo-Ukwu where He excelled in a very high flying performance which earned him a place at the Prestigious Christ the King College Onitsha, where he again excelled brilliantly throughout his stay as a student of that prestigious college. Though he came from poor home having lost his father at a very young age, Chief Engr Barth Nwibe refused to accept the thinking then that with a secondary school certificate, he had attained the highest stage fate and his status could afford him. No, he certainly would have none of that, and this resulted in his gaining admission to the University of Nigeria Nsukka, at the young age of 19, were he had to study Civil Engineering. 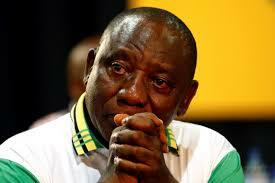 Within a year his academic prowess landed him a scholarship award for the period he studied at the university. On completion of his studies, he answered the national call to service, serving in Degema Rivers State. Fresh from serving the country, Chief Engr Nwibe began his career as a pupil engineer with UMEC Associates before joining WOG, where he so excelled in both firms that both encouraged him to undertake training as a Director drilling specialist placing him as a directional drilling specialist. Moving forward, Nwibe joined firms like Sperry Sun Drilling, baker and Hughes, Halliburton, schlumberger and Shell Petroleum development company,a well known multinationals and the crème de la crème of the oil and gas industry worldwide. By 2006, having seen it all, he braved the odds and went to establish his own firm, SEGOFs Energy Services Ltd in 2006. SEGOFs, an upstream oil and gas company specializes in drilling, measurement and engineering services, where he employs over a thousand Nigerians and has helped dispel the wrong thinking that only foreign firms were capable of participating in the nations upstream sector. Forever grateful to providence,Chief Nwibe has always seen philanthropy as a means of giving back to society. A visit to his homes at Lagos, Port-Harcourt and Igbo-Ukwu will witness a huge crowd of visitors, each with a problem and a hope that once it gets to the ears of Ugo, as he is fondly called, there would be some respite and true to such hopes, Chief Nwibe has always gone out of his way to help people. Chief Nwibe’s philanthropy resonates beyond his kinsmen. 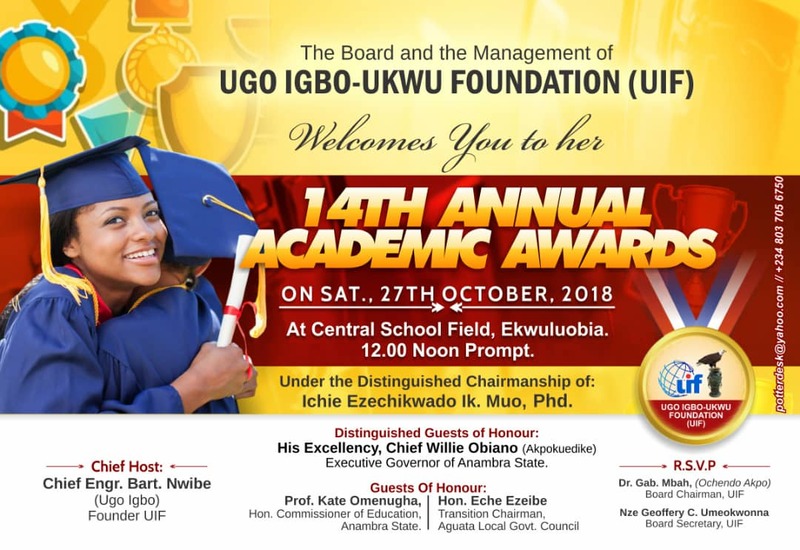 Understanding that he became what he is today by virtue of education, he sought to help brilliant but indigent students continue their education via Ugo Igbo-Ukwu foundation, where he had empowered over 20,000 students, for the past 14 years. Aside that, textbooks and laptop computers have been given to these children and wards whose families would never have been able to afford these items but for the kind intervention of a man like Chief Engr Nwibe. In addition to this, he has set up adult education centre to enable adults who missed the opportunity of learning owing to certain challenges they had earlier in life. Even the disabled in Anambra are beneficiaries of his large heartedness, as his Aguata physically challenged scheme caters to the disabled giving them a monthly stipend as well as engaging them in vocational schools to enable them earn a living. A democrat and progressive to the core, Chief Nwibe had always believed in the tenets of democracy. He eschews violence and had always preached peace and harmony among the various ethnic groups in Nigeria having helped form and finance the ACN and the APC, he refused overtures even the juicy offer of a senate ticket from the PDP to defect from the party then as the ACN and later the APC. 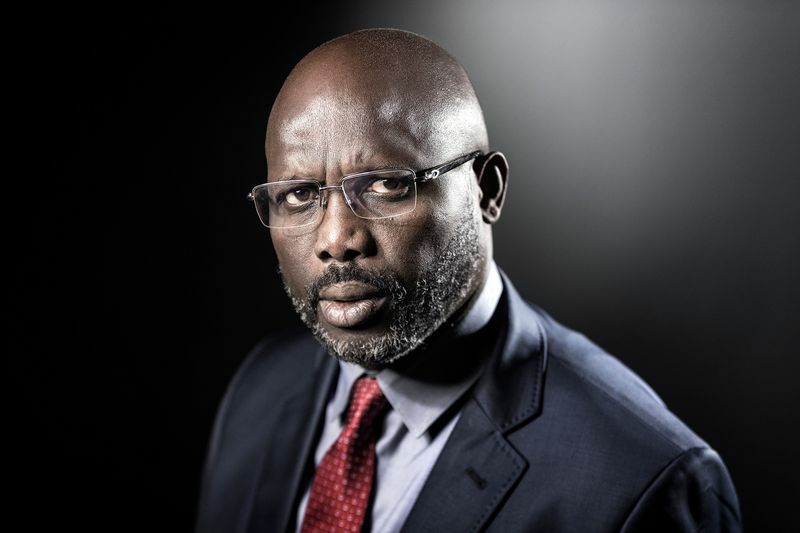 He later campaigned vigorously for the duo of Dr. Chris Ngige and President Muhammadu Buhari in the 2013 and 2015 elections respectively. He was at the centre of Dr Tony Nwoye's Gubernatorial Election Campaign both at the State Level and Aguata Local Government Area. He delivered his town Igbo-Ukwu for APC in that Governorship election. Chief Engr Barth Nwibe is a true and Loyal Party man. He is also happily married to Barr. Mrs Chinwe Nwibe, a successful lawyer and they are blessed with five children.